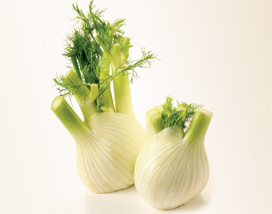 One of the most beautiful looking vegetables around, fennel goes spectacularly well with fish and chicken dishes. It has a delicate aniseed flavour, with all parts of the vegetable being edible - raw or cooked. Try small bulbs roasted whole for a dramatic addition to a special meal. Look for paler bulbs if you want a creamier flavour. For recipe ideas, click here. DGM Growers offers fennel all year round, with British-grown volumes available from around July to November, depending on the weather. We import to cover demand through the rest of the year.